Pablo Ocampo served in the House as Resident Commissioner only briefly, but he was a powerful force on behalf of Philippine nationhood. From his early days as a leader in the revolutionary government to his election to the U.S. House of Representatives, Ocampo helped shape the terms of the Philippines’ relationship with America. On Capitol Hill, he fought to protect the archipelago’s economy from what he considered an unbalanced trade deal and worked to further the concerns of the Philippine assembly. He was, according to Sereno Payne of New York, the chairman of the House Ways and Means Committee, “a gentleman of education, a lawyer, and a man of ability.”1 Ocampo was not fluent in English, but during his time as Resident Commissioner, he spoke compellingly for his home islands. The Partido Nacionalista (Nationalist Party) was first conceived in 1906, the result of efforts to unite the many different opposition leaders in Manila. For much of the preceding decade, politics in the Philippines was unbalanced: there was the pro-American Partido Federal and then there was everyone else, a loose affiliation of factions opposed to American rule. These opposition groups all sought Philippine independence, but subscribed to different levels of urgency—everything from immediate independence to much more gradual freedom. The effort to unite the nationalist camps was still lurching forward when the campaign for the new Philippine assembly began. As part of the Philippine Organic Act of 1902, Congress created a bicameral legislature for the Philippines in which the commission functioned much like the U.S. Senate while the assembly would be popularly elected and fill a role similar to the U.S. House of Representatives.13 It had taken five years, but by the summer of 1907, the Philippines was preparing to cast its first ballots for a popularly elected governing body when Ocampo entered the race. In late February 1908, Ocampo and Legarda accompanied Secretary Taft during his testimony before the House Insular Affairs Committee and nodded along in support as Taft asked the committee to raise the number of seats on the Philippine commission from eight to nine.34 When the commission bill went to the floor two months later, Ocampo did not participate in debate, but Members pointed out that both he and Legarda favored the expansion.35 Ultimately, the bill (H.R. 17516) passed the House and became law a few months later. A stable and lasting independence, however, required a healthy economy. Ever since the war, the Philippines had worked to build an infrastructure and a robust commercial sector. In large measure, however, the future of the islands’ economy would be dictated by its trade relationship with the United States, and that trade relationship fell squarely within Congress’s purview. 1Congressional Record, House, 60th Cong., 1st sess. (2 May 1908): 5609. 2G. H. Blakeslee, “The Gentlemen from Manila,” 18 January 1908, Harper’s Weekly: 14. 3“Pablo Ocampo,” Biographical Directory of the United States Congress, 1774–Present, http://bioguide.congress.gov/scripts/biodisplay. pl?index=O000020. 4Blakeslee, “The Gentlemen from Manila”; Thomas F. Millard, “The First Filipino Delegates to Washington,” 2 February 1908, New York Times Magazine: 9; Frank H. Golay, Face of Empire: United States-Philippine Relations, 1898–1946 (Madison: University of Wisconsin- Madison Center for Southeast Asian Studies, 1998): 32. 5“Civil Rule for the Philippines,” 21 August 1900, New York Times: 6. 7“Filipino Rebels Who Will Go Free,” 1 July 1902, Los Angeles Times: 4. 8“Bribery Used on Insurgents,” 8 March 1901, Atlanta Constitution: 3; Special Report of William H. Taft, Secretary of War, to the President on the Philippines, 60th Cong., 1st sess., S. Doc. 200 (1908): 46; Blakeslee, “The Gentlemen from Manila.” For more on Blakeslee as a scholar and foreign policy specialist, see http://www.clarku.edu/ research/archives/blakeslee/scope.cfm (accessed 23 February 2016), and “George Blakeslee, Educator, U.S. Aide,” 6 May 1954, New York Times: 33. 9“Filipino Rebels Who Will Go Free”; “Two Filipinos To Congress,” 23 November 1907, Chicago Daily Tribune: 5. 11Michael Cullinane, Ilustrado Politics: Filipino Elite Responses to American Rule, 1898–1908 (Manila, PI: Ateneo de Manila University Press, 2003): 128–129. 12Cullinane, Ilustrado Politics: 286–294; Peter W. Stanley, A Nation in the Making: The Philippines and the United States, 1899–1921 (Cambridge, MA: Harvard University Press, 1974): 128. 13Julius W. Pratt, America’s Colonial Experiment: How the United States Gained, Governed, and in Part Gave away a Colonial Empire (New York: Prentice-Hall, 1950): 199. The Philippine Organic Act of 1902 went into effect as Public Law 57-235, 32 Stat. 691 (1902). 14As quoted in Cullinane, Ilustrado Politics: 306. 16“Legarda and Ocampo Are Chosen,” 22 November 1907, Manila Times: 1; Journal of the Philippine Commission, Inaugural Session, vol. 1 (Manila Bureau of Printing, 1908): 94, https://www.hathitrust.org (accessed 18 February 2016). 20“The Selection of Ocampo,” 23 November 1907, Manila Times: 4; “A Radical Filipino Delegate,” 24 November 1907, New York Times: 8. 21Special Report of William H. Taft, Secretary of War, to the President on the Philippines: 46. 22Journal of the Philippine Commission, Inaugural Session, vol. 1: 115, 120, 362–363. 23Ibid., 115, 120, 358–361, 369–370. 26“Filipinos Fear Japan’s Plans,” 20 January 1908, Los Angeles Times: I2. 27Congressional Record, House, 60th Cong., 1st sess. (4 February 1908): 1540; “Commissioners from Philippines to Sixtieth Congress,” 13 February 1908, Los Angeles Times: I2. 28No title, 8 February 1908, New York Tribune: 6. 29“Briefs from Washington,” 18 February 1908, Baltimore Sun: 2. 30“People Met in Hotel Lobbies,” 28 January 1908, Washington Post: 6; David R. Francis, The Universal Exposition of 1904 (Louisiana Purchase Exposition Company, 1913): 566, http://books.google.com (accessed 19 February 2016); John T. Sidel, Capital, Coercion, and Crime: Bossism in the Philippines (Stanford, CA: Stanford University Press, 1999): 58; Murat Halstead, The Story of the Philippines and Our New Possessions, Including the Ladrones, Hawaii, Cuba and Porto Rico (Chicago, IL: Our Possessions Publishing Company, 1898): 61, https://archive.org/ (accessed 19 February 2016); “All Eyes on New York,” 16 August 1908, New York Tribune: 1; “Wright Helped Out by Taft,” 16 August 1908, Chicago Daily Tribune: 7. 31“Needs Interpreter in Congress,” 6 February 1908, New York Tribune: 7. 32“House Scene Recalls Champ Clark’s Vision,” 28 February 1908, Detroit Free Press: 2; “Legislative Briefs,” 28 February 1908, Washington Post: 4. 33Congressional Record, House, 60th Cong., 1st sess. (1 April 1908): 4245. 34Hearings before the House Committee on Insular Affairs, Increase Membership of Philippine Commission, 60th Cong., 1st sess. (20 February 1908): 4. 35Congressional Record, House, 60th Cong., 1st sess. (2 May 1908): 5607–5609. 36“Filipinos Urge Trade,” 14 March 1908, Washington Post: 3; “Speaking Against Tariff,” 17 March 1908, Cablenews-American (Manila, PI): 1; “Delegates Banquetted,” 17 March 1908, Manila Times: 1. 37“Philippines Under Debate,” 23 October 1908, Los Angeles Times: I2. 38Thomas F. Millard, “Philippines Not a ‘Problem’ Nor a ‘Burden,’” 23 February 1908, New York Times Magazine: 2; Thomas F. Millard, “Our Interests and Our Duty in the Philippine Islands,” 23 February 1908, Washington Post Magazine: 4; Thomas F. Millard, “Congress Holds the Key,” 23 February 1908, Chicago Daily Tribune: A1. 39Hearings before the House Committee on Insular Affairs, Qualifications for Electors in the Philippine Legislature, 60th Cong., 2nd sess. (17 February 1909): 1–2. 40House Committee on Insular Affairs, Qualifications for Electors in the Philippine Islands, 60th Cong., 2nd sess., H. Rept. 2184 (15 February 1909). 41Hearings before the House Committee on Insular Affairs, H.R. 32004, 61st Cong., 3rd sess. (26 January 1911); Hearings before the House Committee on Insular Affairs, S. 7400, Administration of Civil Government in Philippine Islands, Part 2, 61st Cong., 3rd sess. (26 January 1911). 42Lewis L. Gould, The William Howard Taft Presidency (Lawrence: University Press of Kansas, 2009): 51–57. 43Pedro E. Abelarde, American Tariff Policy toward The Philippines, 1898–1946 (New York: King’s Crown Press, 1947): 76–77. 44Congressional Record, House, 61st Cong., 1st sess. (2 April 1909): 818; Congressional Record, House, 61st Cong., 1st sess. (3 April 1909): 929–930. 45“Congress Hears Filipino Attack Tariff,” 2 April 1909, Christian Science Monitor: 1. 47Congressional Record, House, 61st Cong., 1st sess. (2 April 1909): 819. 49Congressional Record, Senate, 61st Cong., 1st sess. (21 May 1909): 2240. 50Abelarde, American Tariff Policy toward The Philippines: 100. 51Congressional Record, House, 61st Cong., 1st sess. (24 May 1909): 2238. 52The election was lopsided: Quezon received 61 votes, Ocampo received four, and two other candidates received one vote each. “Legarda and Quezon Chosen,” 15 May 1909, Manila Times: 1. 53“Ocampo Not Puzzled,” 20 May 1909, Washington Post: 12. 54Ibid. ; “Ocampo Much Disappointed,” 22 May 1909, Manila Times: 1; Journal of the Philippine Commission, Second Session of the First Philippine Legislature, vol. 3 (Manila Bureau of Printing, 1908): 502–504, www.hathitrust.org (accessed 22 February 2016). 55No title, 12 August 1909, Washington Post: 7. 56“Ocampo Funeral Set for Saturday,” 6 February 1925, Manila Times: 1; “Pablo Ocampo Dead,” 7 February 1925, New York Times: 15. Papers: In the William Howard Taft papers, ca. 1784-1973, 676,000 items ; 1,562 containers plus 8 oversize ; 902.5 linear feet ; 658 microfilm reels. Correspondents include Pablo Ocampo. Martin, Mart. The Almanac of Women and Minorities in American Politics. Boulder, Colo.: Westview Press, 1999. 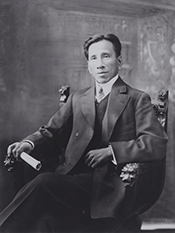 "Pablo Ocampo" in Asian and Pacific Islander Americans in Congress, 1900-2017. Prepared under the direction of the Committee on House Administration by the Office of the Historian and the Office of the Clerk, U.S. House of Representatives. Washington: Government Publishing Office, 2018.